This small tree is on my list for planting early this spring. I intend to use it as a back drop in beds and to help blur the edges. I have edges in my garden — it seems like I go from flat and clear to stick straight 50 ft pines and their isn’t any natural forest edge. The abruptness is jarring and I think I need to soften it all up by blending. Salix exigua is native to much of the western united states and I am quite familiar with it as a plant that colonizes and anchors stream banks. But in the garden I’m going to use it to add texture and a lightweight (but hopefully quickly effective) backdrop . Salix exigua is an upright tree with slender greyish green branches clothed with long, narrow, finely toothed, silky silver leaves and small pale yellow catkins. 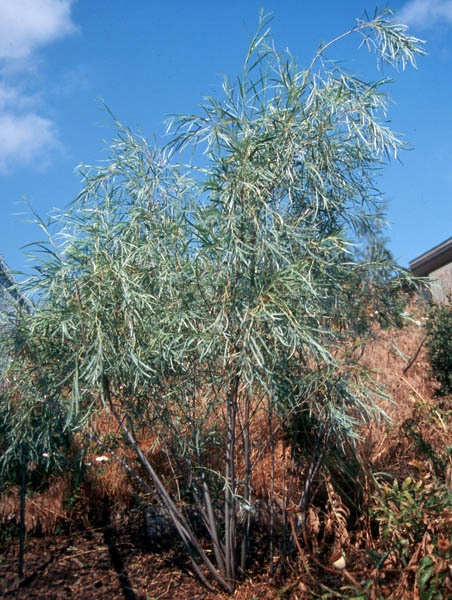 Willows are among my favorite trees, and this small variety will add not only the nice texture, but also the pretty bluish tinged leaves. Have you grown this tree? I am curious, are the suckers a pain to manage? Great soft foliage. I bet it is easy to propagate too. The leaves almost have a Japanese Maple look to them (Acer palmatum). I haven’t grown it, but it’s going on my list now! Thanks for the heads up! I have shrubby Salix purpurea ‘Nana,’ but just planted it this fall. Sadly, tree-sized willows are tough to site on my 1/4 acre lot because much of it sits above a septic system. Could be good for clients, though. this plant grows like crazy on the sandbars and banks of the river across the street. It seems to keep itself fairly well contained within about 20 feet of the water line… don’t know about suckering; they do tend to fall over a bit, and therefore spread out from the ground up – but maybe that’s due to the weight of the snow. Beautiful tree, fairly difficult to maintain, but not overly hard. I wish we had this kind of willow in the landscaping here. I think they look so cool, but the climate is all wrong.